A massive fire has broken out in the middle of London's tech district, with smoke seen bellowing out across the city's skyline. The blaze began at around 9am on Thursday morning (12 November) in a six-storey building that is in the process of being demolished in Old Street, Business Insider reported. Thankfully firefighters were able to tackle the flames and keep the incident under control, thereby stopping it from spreading to the hundreds of nearby businesses. Companies working in busy city centres must be wary of the risk of fires starting in neighbouring buildings and spreading to their site. Business insurance is a vital tool to provide cover for a company's building, as well as the items stored inside. 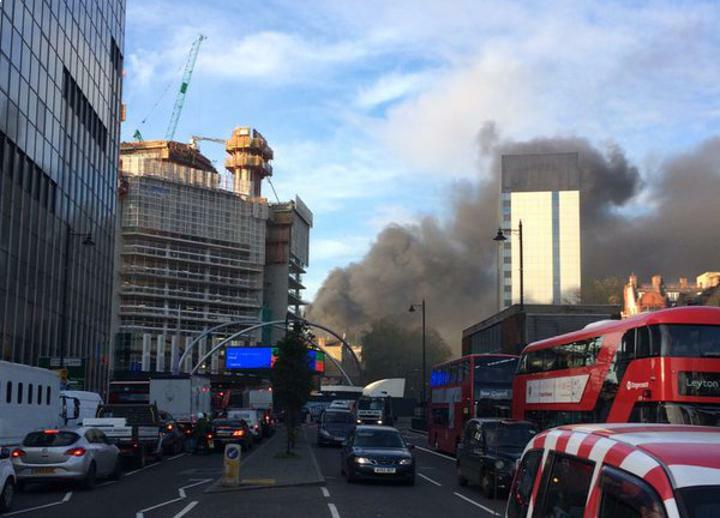 London Fire Brigade station manager Gareth Cook commented on the Old Street fire: "Crews worked hard to contain this blaze and to stop it from spreading. The main fire was concentrated around the building's central lift shaft. This created a chimney effect, which is why smoke could be seen for miles around during the early stages of the incident." Old Street is in the heart of 'Tech City', which is the name given to the area of east London that houses thousands of startups and tech giants. None of the businesses were damaged as a result of the fire and no members of the public were hurt. The incident prompted a huge number of posts on social media, including a tweet from one passerby named Scott (@scotscotscot) who posted a picture of the smoke emanating from the derelict building (seen here).